If you really look at the aftermath of Iraq, Iran is going to be taking over Iraq. They've been doing it. And it's not a pretty picture. 'Hostel' is that's how I feel about what's going on in Iraq. There's people that just want money and people are being sacrificed for it. And now the really difficult part: We have to rebuild Iraq into a strong and independent nation that will one day hate the United States. It's great that we're bringing democracy to Iraq. I can't wait to see how we do it! What are we gonna do, give them our civics textbooks? When President [Barack] Obama announced that he was leaving Iraq, I mean, he was talking about dates and times and what we're going to do. The President reminded us that the war in Iraq is a central battlefield in the war on terror that began the morning of September the 11th. The Iraq fight itself is probably going to go very, very fast. The shooting should be over within just a very few days from when it starts. States like (Iraq, Iran, & North Korea), and their terrorist allies, constitute an axis of evil, arming to threaten the peace of the world. Americans were told repeatedly by President Bush and Vice President Cheney that Iraq had weapons of mass destruction. None were ever found. Most people think the Iraq war has increased the probability of an attack. However, it's difficult to put this aspect into financial terms. One of the things that we don't want to do is to destroy the infrastructure of Iraq, because in a few days we're going to own that country. When I turn the thought around - the thought that war, let's say war in Iraq, should stop - the turnaround is the war in myself should stop. I am neither a pessimist nor an optimist. I am a realist, and the reality in Iraq is that it has been very hard and it continues to be hard. Unlike Hillary Clinton, who voted for the war without knowing what she was doing, I would not have had our people in Iraq. 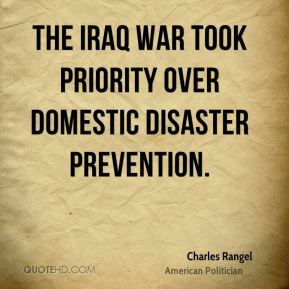 Iraq was disaster. The brutal regime of the dictator fell ... the regime that ruled Iraq for decades, the decades of darkness. The decades that were of tyranny. If Trump really opposed the war in Iraq, all he has to do is show us the evidence. It would take five minutes. He hasn't done it. He's lying. The notion that the press was used in the [first Iraq] war is incorrect. The press wanted to be used. It saw itself as part of the war effort. To deny a genocide because of convenience and expediency having to do with an illegal war or occupation in Iraq to me, is double hypocritical. The invasion of Iraq was a bandit act, an act of blatant state terrorism, demonstrating absolute contempt for the concept of international law. The Democrats say that President Bush doesn't have an exit strategy for Iraq. Of course he does. If things don't go well, he exits in November. There was never a recorded Iraqi terrorists in the last 20 years in any terrorist attack. 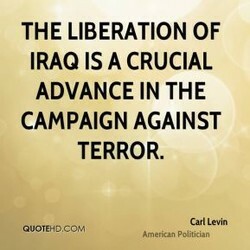 There were no terrorists in Iraq until we invaded it. 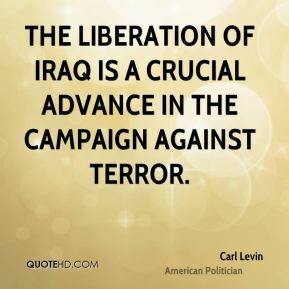 I think things have gotten so bad inside Iraq, from the standpoint of the Iraqi people, my belief is we will, in fact, be greeted as liberators. Iraq should commit itself to implement the U.N. resolutions, and the Iraqi leadership should put the interests of its people into consideration. Then when [ISIS] moved into Iraq, the Sunni Muslims didn't object to their being there and about a third of the territory in Iraq was abandoned. In Iraq, many of my female friends were architects and professionals with a lot of power during the 1980s while all the men were at war in Iran. This was a war that was based on lies. It was wrong for us to invade Iraq. It's wrong for us to occupy Iraq and we need to bring our troops home. US Ambassador to Iraq Ryan Crocker and I have repeatedly sought to emphasize that the progress in Iraq is fragile and also, possibly, reversible. The people of Iraq realize that a stable, successful, democratic Iraq can only come about if average Iraqis are willing to sacrifice to build it. I hope we do not see another Iraq-type operation for a long time - without UN approval and much broader support from the international community. The United States must reach out to the world community with a new plan to stabilize Iraq, bring U.N. peacekeepers in, and bring U.S. troops home. [Chelsea] Manning leaked more than 700,000 classified files and videos to WikiLeaks about the wars in Iraq and Afghanistan and U.S. foreign policy. If we invade Iraq and the regime is very close to falling, I'm very, very concerned that the Iraqis will, in fact, use weapons of mass destruction. No matter how tough Iraq became, removing Saddam Hussein was the right thing to do for the sake of peace and for the 25 million people we liberated. While I disagree with our presence in Iraq and Afghanistan, I have nothing but respect and admiration for the men and women deployed in these places. I think the behavior of the troops has been a huge factor in the rise of the insurgency and in the rise of the anti-American feelings there[in Iraq]. The truth is not being aired in the West. Itâs a surreal perversion of history thatâs going on once again, as in Bush pre-Iraq âWMDâ campaign. I was against the war with Iraq. First of all, they didn't knock down the World Trade Centre. It wasn't Iraq that knocked down the World Trade Centre. In the wake of winning the war, Poland wants to help win peace with Iraq. I believe that the international community cannot leave Iraq without support. There was no evidence that Saddam Hussein was involved with the attack of 9/11, I've never said that and never made that case prior to going into Iraq. No one in this body wants to see terrorism and the rule of force prevail in Iraq. Some on the other side say otherwise, but I believe they know better. I am reading "The Yellow Birds" by Kevin Powers and "Redeployment" by Phil Klay . Both Powers and Klay are Iraq War vets. Klay's stories are remarkable. In California, 50 women protested the impending war with Iraq by lying on the ground naked and spelling out the word peace. Right idea, wrong president. I believe that the government that governs best is a government that governs least, and by these standards we have set up a fabulous government in Iraq. Just like we did in Japan, in South Korea. Just like is happening in Iraq. Laura [Bush] and I feel very strongly that if the United States were to leave. I would need to see changes in the Iraq governance. Otherwise I don't think strikes are going to have any impact and could be very well counterproductive. I agree with the president [Barack Obama]. 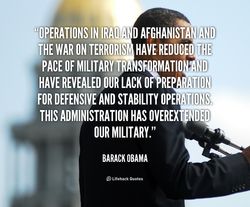 I've said myself, we will not send American combat troops back to either Syria or Iraq - that is off the table. Jeb Bush has being slammed by his own party for a very messy response to questions about his brother`s war in Iraq. He should have been ready for this one. I was blessed to go abroad and bring Americans home from jail in Syria, and Iraq, and Cuba, and Yugoslavia, and Liberia, those are high moments of my life. And I think the almost undeviating support by Great Britain for the ill-advised policies of President Bush in Iraq have been a major tragedy for the world. There has, indeed, been very substantial progress in Iraq over the past year - violence is down by 80 percent, civilian deaths by about the same, and so on. I saw a poll that said the right track/wrong track in Iraq was better than here in America. It's pretty darn strong. I mean, the people see a better future. In the Arab mindset, democratization may not be an exclusively negative term. But it's associated closely with American policies and the occupation of Iraq. They did an article in a major magazine, shortly after the war started. I think in '04. But they did an article which had me totally against the war in Iraq. We in Iraq have not descended from another planet. 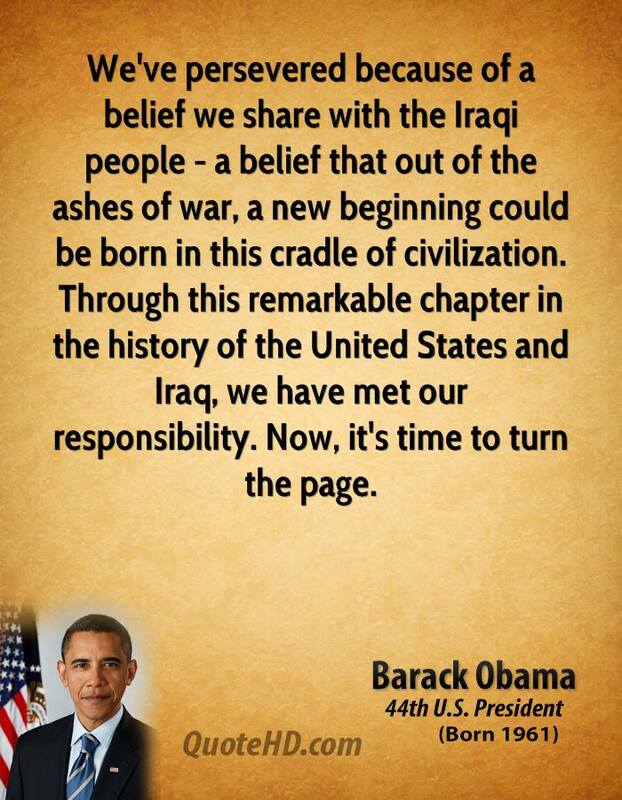 Just as people in many other countries have gotten over the tragedy of war, Iraq will get over its ordeal. From the War for Independence to today in Iraq and Afghanistan, I am inspired by the courage, professionalism and patriotism of our men and women in uniform. I find it hard to imagine that future historians will see the Iraq War as a big plus in Bush's ledger, but we have to admit that we simply don't know for sure. As far as the Internet is concerned, we're not talking about closing the Internet. I'm talking about parts of Syria, parts of Iraq, where ISIS is, spotting it. There is only one superpower now and it doesn't know what to do with its status. As a result, we got Yugoslavia and Iraq, and the situation has only got worse. No terror state poses a greater or more immediate threat to the security of our people and the stability of the world than the regime of Saddam Hussein in Iraq. We shouldn't have been in Iraq, but HillaryClinton did vote for it. We shouldn't have been in Iraq, but once we were in Iraq, we should have never left the way. I think I have great knowledge of foreign policy, frankly. And despite what some people said, I was always against the war in Iraq, and a lot of people weren't. I don't know why people are surprised the French don't want to help us get Saddam out of Iraq. After all, France wouldn't help us get the Germans out of France. The administration does not agree with those who suggest we should deploy hundreds of thousands of American troops to engage militarily in a ground war in Iraq. Its very strange that you condemn me as a terrorist at the same time as you call on me to help you combat terrorism in Iraq and elsewhere. It doesnt make sense! Progress in Iraq has always been about teams of people and teams of teams - and ultimately about young men and women, Iraqi as well as people from the coalition. In his speech President Bush said we need to rebuild Iraq, provide the people with jobs, and give them hope. If it works there maybe we'll try it in New Orleans. I think a lot of the national Democrats believe that, you know, Iraq is a distraction and not part of the War on Terror. They've said so. And I strongly disagree. I studied at the Academy during the years of economic sanctions. Life was almost dead because the sanctions imposed on Iraq by the civilized world were so strict. And then there's Israel - a lot of people support Israel, and it's important to Israel to take out Iraq. So it's all mixed together. It's a combination of motives. There are guys over in Iraq that have been there for up to 14 months. It has been really tough on them. So any support that I can give; I'll give as much as I can. Government-mandated and -subsidized ethanol from corn will go down in history as the "Iraq War" of environmental solutions: ill-considered, costly, and disastrous. Why are we working so hard to preserve Iraq, a fake country to begin with? Why do we care whether this fake country that was drawn on the map 100 years ago remains? I like to tell people when the final history is written on Iraq, it will look like just a comma because there is -- my point is, there's a strong will for democracy. Pentagon records show that at least 8,000 members of the all-volunteer U.S. Army have deserted since the Iraq war began. Hey, at least somebody has an exit strategy. In America, every time we take rebels, whether it's in Iraq or anywhere else, we're arming people. And you know what happens? They end up being worse than the people. Iraq is a very wealthy country. Enormous oil reserves. They can finance, largely finance, the reconstruction of their own country. And I have no doubt that they will. The average 20-year-old serving us in Iraq knows more about their country's national security than the average 20-year political veteran serving in the Congress today. 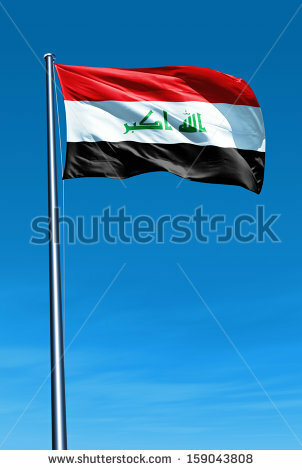 For the first time the people of Iraq are united. Today on CNN I saw a Kurd, a Shiite and a member of the Republican Guard coming together to cart off a big screen TV. According to a new geographic literacy study 4 out of 10 American students couldn't find Iraq on a map. However 10 out of 10 Mexicans could find the U.S. without a map. I think the press, which arguably was cowed by the (Bush) administration in the run-up to the war with Iraq, was certainly not cowed in covering the aftermath of Katrina. The work in Iraq is difficult and it is dangerous. Like most Americans, I see the images of violence and bloodshed. Every picture is horrifying, and the suffering is real. Over in Iraq after you vote they paint your finger purple so you can't vote again. It's a flawless system. It works perfectly unless, of course, someone has paint remover. One of the coolest things was that, in 2007, I got to go to Iraq with Rob Riggle, Paul Scheer, and Horatio Sanz. We went over there to do some comedy shows with the U.S.O. The current situation in Iraq is ultimately a crisis of governance, which has allowed extremist groups to take advantage of disillusioned segments of the Iraqi population. Iran is taking over Iraq. They've been trying to for many, many decades. And now they're finally taking over Iraq. As we sit here, they're taking over Iraq. We get nothing. In 2003, Congress should have resisted the rush to a war of choice with Iraq. I will do everything in my power to prevent us from repeating the mistakes of my predecessors. House Speaker John Boehner says President Obama should have clearly outlined his exact plans before bombing Libya. Apparently it's only Iraq where you don't have to do that. The day that I can land at the airport in Baghdad and ride in an unarmed car down the highway to the Green Zone is the day that I'll start considering withdrawals from Iraq. I am pleased to inform you of the decision of the Government of the Republic of Iraq to allow the return of the United Nations weapons inspectors to Iraq without conditions. Oftentimes Westerners don't really understand fully the values of this particular culture. And I think the jury is still out as to whether democracy can really thrive in Iraq. Lieutenant General Michael Flynn ran the defense intelligence agency from 2012 to 2014. He served as a top national intelligence adviser to General Stanley McChrystal in Iraq. There is a warning for those Muslim countries, which witnessed all these as a silent spectator. What had earlier been done to the innocent people of Iraq, Chechnya, and Bosnia? The world protested our invasion of Iraq, but the people of America were never made aware of that - through the censorship that goes on here, and believe me it's going on here. 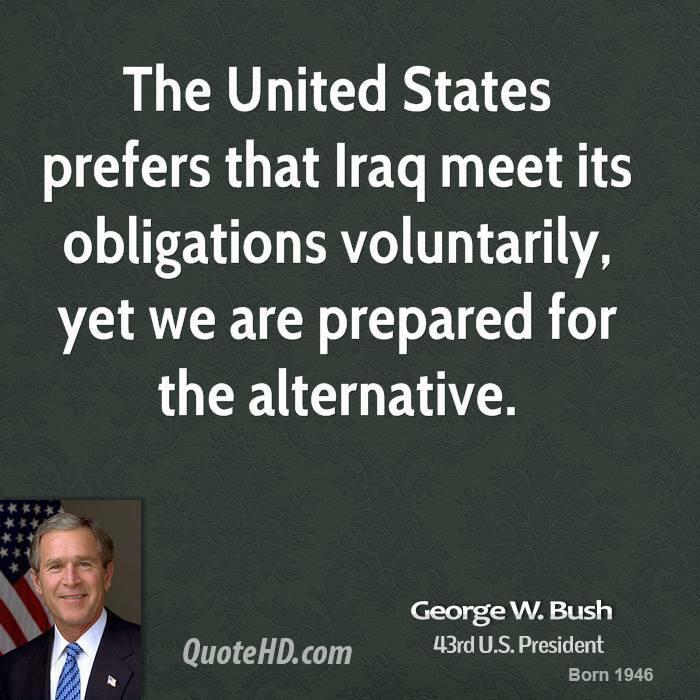 President Bush bet his presidency-and America's world leadership-on the war in Iraq. Tragically, it looks as though he bit off more than the American people were willing to chew. I have no idea what the U.S. intends to do further there and what would be the reaction of the Iraqi people. I only know that the sole option is to leave Iraq to the Iraqi people. [Invading Iraq] is not the best way to make a safer world in which the United States would be a responsible partner, but it also goes against the role of law in the United States. I feel like I partly came to writing through being in college during the start of the Iraq war, and knowing that those issues mattered lot to me, and wanting to go see for myself. Western conception of history has had great consequences over the last two hundred years. You see it in the invasion of Iraq. You see it in almost everything that is said and done. I don't think for a minute we went to Iraq for oil. It just so happened that it had oil. But I think we'll come out of the Iraqi situation with a call on their oil at market price. President Bush is often out there talking about the importance of staying the course, and about the sacrifice, but he has not attended a funeral of a soldier who has fallen in Iraq. A lot of controversy over this possible invasion of Iraq. In fact, Nelson Mandela was so upset, he called Bush's dad. How embarrassing, when world leaders start calling your father. There is a much cheaper way, less complicated way to bring Iraq and Saddam Hussein to its knees: it is simply to send the Bush economic team over there and let them run the country. Whether weapons exist in Iraq, Saddam Hussein or post-Saddam Hussein, it is a serious enough issue that require that we continue to go and make sure that Iraq does not have weapons. Our resistance to this war should be our resistance to profit at the cost of human life. Because that is what these drums beating over Iraq are really about. This is about business. Some Democrats say the estimated $60 billion dollar cost of a war with Iraq could be better spent at home. When he heard that, President Bush agreed and announced plans to bomb Ohio. Imagine foreign troops sitting idly, laughing as hooligans trashed the Smithsonian, stole the gold from Fort Knox and burned down the Department of the Interior. That was us in Iraq. 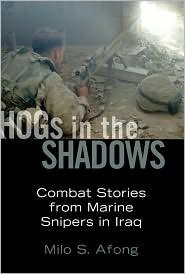 We like to look out on the world and see ourselves, so we have many, many novels, memoirs, and short stories in Iraq that are largely about Americans in Iraq, doing what Americans do. George Bush sold us on going to war with Iraq based on the threat of weapons of mass destruction. But we still haven't found them. ... We were misled about weapons of mass destruction. The likely economic effects [of the war in Iraq] would be relatively small... Under every plausible scenario, the negative effect will be quite small relative to the economic benefits. The story goes on in the sense that at a most basic level, the United States ignored, that is violated, the United Nations charter when it invaded Iraq in 2003. This is not wise policy. The new update of 2014-2015 is, of course, the attack of ISIS. But this is rooted in recent history. 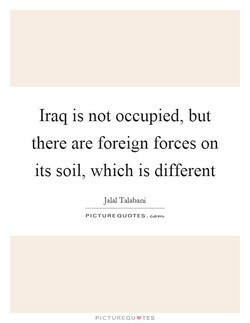 It is the direct result of all the politics that came into Iraq with the occupation. Any strike will be as direct support to Al-Qaeda offshoot that's called Jabhat al-Nusra and the Islamic State of Iraq and Syria. You're right about this. It's going to be direct support. I'm reading a bunch of fiction by Afghan and Iraq War veterans for a New Yorker piece. There hasn't been that much, but it's starting to come out, and some of the fiction is really good. The budgetary cost to the UK of the wars in Iraq and Afghanistan through 2010 will total more than Â£18 billion. If we include the social costs the total impact will exceed Â£20 billion. Whether or not Afghanistan would be a peaceful nation-state had we not gone into Iraq I doubt. Afghanistan is going to be Afghanistan, no matter how hard we try to make it something else. Saddam Hussein has invited members from the U.S. Congress to visit Iraq. Man how stupid is Hussein? If you think Bush had incentive to bomb Iraq before, imagine if Congress was over there. I believe that President [George W.] Bush was correct. I thought that Iraq had weapons of mass destruction, and I supported him steadfastly, and once we committed we should see it through. The world's politics are in turmoil, not to mention the Mideast, where the US has mounted attacks from Libya to Iraq to Syria, and ISIS is attacking governments in today's pipeline rivalry. Halliburton is not a 'company' doing business in Iraq. It is a war profiteer, bilking millions from the pockets of average Americans. In past wars, they would have been arrested - or worse. If the thumbnail version of the Iraq war was that Bush lied about WMD, the thumbnail version of Obama's war in Afghanistan is that the generals pushed him into a war he didn't want to fight. I don't think it's surprising we will have to look for them. I'm confident that when the Iraq Survey Group has done its work we will find what's happened to those weapons because he had them. Rejection would be a disaster for the U.S., but ratification alone will not end our problems in Iraq. Even if the constitution is ratified, the insurgents are not going to lay down their arms. The greatest compliment of the book [One Thousand Gifts]? Maybe the Muslim man in Iraq who was given the book and came to a saving knowledge of Jesus, wanted to live his life in thanks to God? There is no more "front" and "rear" where Fobbit-types would go to hide out in safer locations. In Iraq and Afghanistan, you engaged in a theater of operations that's 360 degrees at all times. Most people forget that even in Iraq, by the time the air and no-fly zone was established, the air defence system had been removed through the first Gulf war. All of them had been neutralised. The two policies that Ken Clarke is most famous for are his opposition to the Iraq war and being a very defensible and quite courageous pro-European. These are both policies he shares with us. But then Iraq happened after September 2001 and America claimed that Al Qaeda was there, and we all know that was a lie and we now know that our own Prime Minister deceived the country terribly. The overall physical demand that Iraq has is pretty amazing. It's 130 degrees, and the soldiers are carrying about 100 pounds of extra gear. It's a pretty rigorous schedule and routine for them. It's pretty clear we have enough Guard people in the United States, but are they capable of handling our oversees commitments as well? We need to figure out how that impacts our ability in Iraq. We have also discovered through intelligence that Iraq has a growing fleet of manned and unmanned aerial vehicles that could be used to disperse chemical or biological weapons across broad areas. I mean, of course that's a theoretical question, and we don't know what it would be for, and we don't know how many numbers there are. I am against American combat troops being in Syria and Iraq. What people can survive and what they don't survive is shocking to me. Someone can go to Iraq and be blown to bits and survive. Someone can trip and fall on the street and they die - that's that. Early withdrawal from Iraq would result in unarguably, defeat and humiliation for the United States. There's no question. We would be defeated by definition. We would be humiliated in that defeat. With the war in Iraq, he [Dalai Lama] feels that the causes of that lie maybe hundreds of years ago, and he says, "What we do now may have consequences far into the future that we will never see." I run into a lot of kids who are either on R&R, or on their way to Iraq. They all know who I am and are fans, but they're kids! I am yet to meet one that's over 23. Yet they're full-time warriors. I'm not saying that George W. Bush did everything right. But even if you take a skeptical view of his Iraq war, [Barack] Obama made the more serious error of withdrawing his troops from Iraq early. The only way that American troops could have stayed in Iraq is to get an agreement from the then-Iraqi government that would have protected our troops, and the Iraqi government would not give that. When Jeb Bush came on the shows and couldn't answer questions about Iraq, and when he looked like he was unsteady, it absolutely solidified the concerns that they had had all along about his skills. Hillary Clinton and Barack Obama are responsible for the growth of ISIS because they precipitously withdrew from Iraq in 2011 against the advice of every single general and for political expediency. To the people who are upset about their hard-earned tax money going to things they don't like: welcome to the f*cking club. Reimburse me for the Iraq war and oil subsidies, and diaphragms are on me! The soldiers in Iraq are fighting, suffering and dying . . . anonymously and pointlessly, while the rest of us are free to buckle ourselves into the family vehicle and head off to the malls and shop. The Republicans are calling the Democrats' plan to have a deadline for US troop withdrawal from Iraq an 'admission of failure', as opposed to the Republican plan which is 'failure without admission'. On the battlefield, (the U.S. war in Iraq) cannot be considered a success. It's a struggle. We're doing what we can to support them with equipment, assistance, training, and sharing any intelligence. Combat forces of the United States, Great Britain, Australia, Poland, and other countries enforced the demands of the United Nations, ended the rule of Saddam Hussein - and the people of Iraq are free. It's been over a year since they've graduated, but neither of the Bush twins have found any work. Why don't they sign up (for military service in Iraq)? Do they hate America, or just freedom in general? The role that General [James] Mattis played as the convening authority, basically the boss, of the entire military justice process around this massacre, often called the My Lai massacre of the Iraq War. There was promulgation of false propaganda by the administration about the existence of weapons of mass destruction in Iraq. There was promulgation of false propaganda about Iraq as a base for Al Qaeda. Spain's new Prime Minister Jose Luis Rodriguez Zapatero announced he will soon call back Spain's 1300 troops from Iraq - meaning the coalition of the willing is fast turning into a duet of the stubborn. In Iraq, we did have dictators, we did have times of war but it never reached the point where one person, or a group, would be attacking another group and would be enslaving all the women of that group. I'm guessing our soldiers are happy to be leaving Iraq. It is no fun being in a country where there's crumbling infrastructure and an ignorant population, but they said they're happy to come home anyway. In Iraq, a ruthless dictator cultivated weapons of mass destruction and the means to deliver them. He gave support to terrorists, had an established relationship with al Qaeda, and his regime is no more. I firmly believed we should not march into Baghdad ...To occupy Iraq would instantly shatter our coalition, turning the whole Arab world against us and make a broken tyrant, into a latter-day Arab hero. I'm driven with a mission from God. God would tell me, 'George, go and fight those terrorists in Afghanistan .' And I did, and then God would tell me, 'George go and end the tyranny in Iraq ,' and I did. [S]ince their candidate lost, many [Democrats] have allowed their hatred of George W. Bush to put them in the tragic position to be cheering for the same result in Iraq as Osama Bin Laden and al Zarqawi. Iran has, by virtue of its growth and by virtue of the United States' mistakes in Iraq, tilted the balance of power in the Middle East. That is the case, but that doesn't necessarily mean it is a threat. The United States has been essentially engaged in an ongoing war that most people date from 2001. That war has taken us to Afghanistan, to Iraq, in a lesser way to other countries - Libya, Somalia, Yemen. The irony is that what was supposed to be a great vulnerability of Hillary Clinton , which the Iraq war vote which she has acknowledged was a terrible mistake, has lent an aura of strength in a funny way. [Operation] Rockingham was spinning reports and emphasizing reports that showed non-compliance (by Iraq with UN inspections) and quashing those which showed compliance. It was cherry-picking intelligence. I've said consistently that I always reserve the right, in conjunction with a broader international effort, to prevent genocide or any wholesale slaughter than might happen inside of Iraq or anyplace else. I should have voted for the first Iraq war. George Bush did that one very well. I had been skeptical. I was afraid that George Bush was going to treat the first Iraq war the way his son treated the second. Good news from France, where the man picked by Nicolas Sarkozy as his foreign minister is not the execrable Hubert VÃ©drine, but Bernard Kouchner - a socialist who supports Israel and the invasion of Iraq. Things aren't getting better; they're getting worse. The White House is completely disconnected from reality. It's like they're just making it up as they go along. The reality is that we're losing in Iraq. According to a recent Harvard study, $6 trillion, when you include the ongoing healthcare expenses for our wounded soldiers, which is the least they deserve, but $6 trillion for Iraq and Afghanistan alone. There are 160,000 of our men and women in Iraq that wonder whether there is going to be a hand grenade or a missile lobbed into where they are sleeping at night. Those are people who make a real sacrifice. Before 2003, none of us knew which part of the country was Sunni and which part was Shi'a. This was something new to Iraq and we are reaping the results at this point. Women's wellbeing has paid the price. If the Americans would only take all the money they have spent on this war (Iraq), and spend it like Soros has done on civil societies in these countries, then in 10 years they would have wonderful results. I would like to see a law legalising women's shelters in Iraq. I would like to see our radio being opened again as a result of the pressure that we're putting on the governmental body that could allow this. What has ISIS done to the women in the cities they have conquered? Direct enslavement, humiliation and turning women into concubines to be bought and sold. This was something nobody expected to see in Iraq. American forces in Iraq found $650 million in American cash sealed in a hidden cottage. See, this is why President Bush wants to invade Iraq, the whole place is oil and cash. It's like Republican Disneyland. While Jeb Bush finds himself mired in the muck of an intramural fight in his own party over his remarks about the Iraq War, Hillary Clinton is sticking to the low-key strategy, and it looks like it`s working. The coalition did not act in Iraq because we had discovered dramatic new evidence of Iraq's pursuit. We acted because we saw the evidence in a dramatic new light - through the prism of our experience on 9/11. We have an excellent list of speakers, but the spark will be provided by the crowd to turn talk into action. The Iraq occupation and the government's bumbling effort in New Orleans, has people wanting to act. Iraq is sort of a situation where you've got a guy who drove the bus into the ditch. You obviously have to get the bus out of the ditch, and that's not easy to do, although you probably should fire the driver. I can't watch the news anymore. They have their priorities all out of whack. All I see is Natalee Holloway and Britney Spears and the war in Iraq. Where's the substantive news? Where's the Zach Braff coverage? Donald Trump has no credibility to criticize me or my record or anything that I have done. If he had spent a minute in the deserts of Afghanistan or in the deserts of Iraq, I might listen to what he has to say. The only people benefiting in Iraq war are George Bush's Jr. friends in the oil industry. He has done the American economy and the global economy an enormous disfavor, but his Texan friends couldn't be happier. We've given Iraq a chance. Now they need to stand on their own. This is a 1,400-year-old conflict, and unless we are prepared to bankrupt ourselves spending another 1,400 years policing it, we need to stay out. Twenty-one years ago today Saddam Hussein was first elected president of Iraq and he has been re-elected ever since. Apparently they have the same electoral process we do, you don't need the popular vote to win. I think it reflects the reality on the ground, that this was an important milestone that's been achieved by the Iraqi people, and it's a significant development. It's a real hopeful moment for democracy in Iraq. This aggression will not stand. 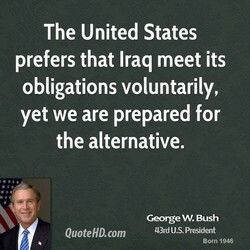 With these words, George Bush committed the United States to the liberation of the oil-rich Kingdom of Kuwait, after it had been occupied by the Republic of Iraq in August of 1990. Iraq will drive American agenda for a long time because Iraq policy has so damaged America in the Middle East region, left us isolated. We are there now by brute strength, we are not there because we are desired. Hillary [Clinton] saying we're never going to put boots on the ground in Iraq, we never going to put boots on the ground in Syria petrified me, simply because, why - what if this continues despite out of control. It [the Iraq invasion] was absolutely an error. It's obviously clear the evaluation of weapons of mass destruction proved not to be correct. That's absolutely true and that's why we're not sending anybody to Iraq. I will be asking my network to lead a discussion on the issues of class, race, energy, the environment, disaster planning, Iraq -- all those things and more. This encompasses so many of the major issues of our time. American troops on the ground in Afghanistan and Iraq. And so she [Hillary Clinton] is saying we're not going to go back down that road, which is what the American people want. They don't want us putting more troops. I wish that after the war against Saddam Hussein we had been more effective at rebuilding Iraq quickly. I think had we done it from the provinces, in, rather than from Baghdad, out, we might have been more successful. The big issue is whether the United States will succeed in its venture of reshaping the Middle East. It is not clear to me that using military force is the way to do it. We should not have gone into Iraq. But we have. Should any Iraqi officer or soldier receive an order from Saddam Hussein.... don't follow that order. Because if you choose to do so, when Iraq is liberated, you will be treated, tried and persecuted as a war criminal. I think Donald Trump's history has shown that this was a very problematic thing. There were so many ways Iraq could have gone awry once we started, and I don't think most of us spend enough time considering the dangers. Through Clinton and Monica, Clinton and Hillary, the scandal, the impeachment, Iraq, Bruce and Demi, Ellen and Anne, I have remained consistently and nauseatingly adorable. I have, in fact, been known to cause diabetes. Iraq began destroying those missiles they don't have over the weekend. See, President Bush may be the smartest military president in history. First, he gets Iraq to destroy all of their own weapons. Then he declares war. I'm not in Iraq. I'm here in California. Have I had an argument with my husband today? Have I been at war with someone in my life today - or with myself? Let me work on that. That way war is ending somewhere in the world. 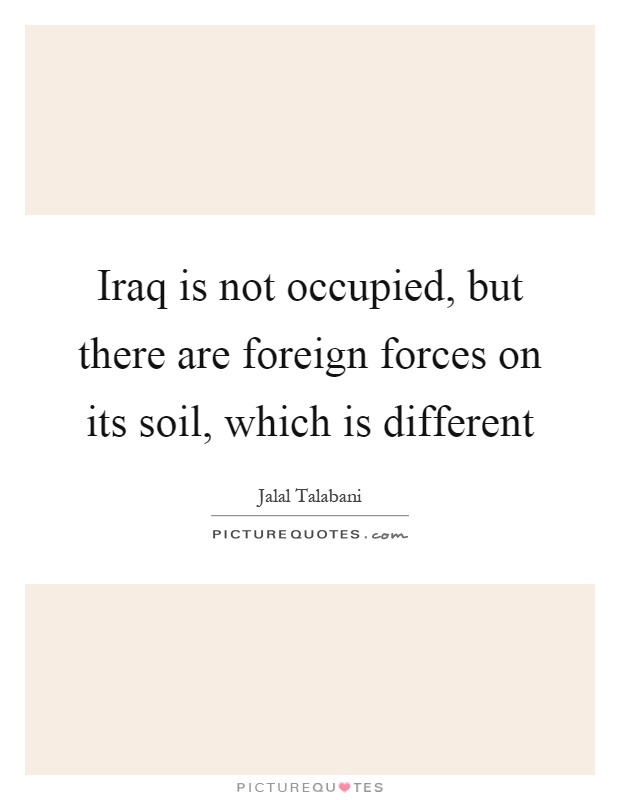 What is happening in Iraq now is awful, but it is a consequence of our invasion, not our withdrawal.The blame for what's happening right now is squarely at Maliki's feet. This is not a responsibility of the United States. Iran should write us yet another letter saying thank you very much, because Iran, as I said many years ago, Iran is taking over Iraq, something they've wanted to do forever, but we Americans have made it so easy for them. I would caution anyone who thinks the solution is to get out to realize that Iraq will be our problem, whether we're there or not, for years to come. It will not be Vietnam; it will not let us go home and lick our wounds. The students often like to talk about movies that they feel are Orientalist like 300 or Babel. They talk a lot about the possibility of U.S. aggression against Iran and the Iranian hostages being held by the U.S. in Iraq. Take like, say, Obama, he's called "liberal" and he's praised for his "principled objection to the Iraq war". What was his "principled objection"? He says it was a "strategic blunder," like Nazi generals after Stalingrad. It's hard to conceive that it would take more forces to provide stability in post-Saddam Iraq than it would take to conduct the war itself and secure the surrender of Saddam's security forces and his army. Hard to imagine. The idea of accountability in Vietnam, Nicaragua and now Iraq - the media never has that in its quiver. When you see time after time there is no possibility of Nuremberg [war crime trials], we're doomed to have it repeated. We are very grateful for the vital contributions Germany has made to this fight, training local forces in Iraq, sharing intelligence providing reconnaissance aircraft including the recent deployment of additional NATO AWACS. I look at what the president [Barack Obama] it doing, it adds up to me. We just have to keep - try to get more support for those people on the ground in Syria and Iraq who have to actually physically take the territory back. Fiction is a very powerful tool for teaching history. The Philippines was the first Iraq, the first Vietnam, the first Afghanistan, in the sense that it was the United States initial or baptismal experience in nation-building. Lying is forbidden in Iraq. President Saddam Hussein will tolerate nothing but truthfulness as he is a man of great honour and integrity. Everyone is encouraged to speak freely of the truths evidenced in their eyes and hearts. Saddam is neither friend nor brother to us, and he will never pay off debts to us. It's the question of precedent: today the United States doesn't like Iraq, tomorrow Syria, then Iran, North Korea and then what: everyone else? Itâs clearly established in terms of training, provision of bomb-making experts, training of people with respect to chemical and biological warfare capabilities, that al-Qaeda sent personnel to Iraq for training and so forth. What we also know is we haven't found them [weapons of mass destruction] in Iraq - now let the survey group complete its work and give us the report... They will not report that there was no threat from Saddam, I don't believe. Experience is not the only point, judgment is. And once again, back in 2002, when we both [with Hillary Clinton]looked at the same evidence about the wisdom of the war in Iraq, one of us voted the right way and one of us didn't. Wish we could, and allow the Taliban or anybody else to reclaim that country. But what we must do is some progress in Iraq, where finally the Iraqi army, which has not been a particularly effective fighting force, retook Ramadi. As a final example, let's remember Jeremy Glick, whose father died in the World Trade Center. After his name appeared in an ad opposing war in Iraq, Mr. Glick was invited on The Factor .. I'm not going to dress you down anymore. Kay told CNN he is worried because he's hearing some of the same signals about Iran and its nuclear program that were heard as the Bush administration made its case for the war in Iraq. 'It's dÃ©jÃ vu all over again,' Kay said. Al-Qaida in particular remains dangerous, and there [in Iraq] is some residual militia and special group presence. There are still between 20 and 30 attacks per day, still periodic car bombs and still loss of innocent civilians. ISIS is a virulent, nasty organization that has gained a foothold in ungoverned spaces effectively in Syria and parts of western Iraq. We have to take it seriously. They've shown in Paris what they can do in an organized fashion. In trying to imagine this world, I kept coming back to Michel Aflaq. He's a Christian Arab, a Syrian, who ends up finding his home in Iraq and is buried there - I was stunned to see his tomb is right smack down in the Green Zone. I think indeed our response on counterinsurgency needs to be finely tuned to the needs of Afghanistan. This is not Iraq. We don't have a Sons of Iraq here. We don't have the same divisions here that we had between Sunni and Shia. Well, first of all, I have to say that Iraq has already used weapons of mass destruction against her own people and against Iranians during their long war, so we know that weapons of mass destruction are existent with the Iraqis. I don't think you can solve what's going on in Iraq unless you can deal effectively with the region and you can't deal effectively with the region if you start with the premise that you can't talk to people who disagree with you. The modern wars are also omnipresent in our electronic media - to be cynical about it, we now have 24 hours of non-stop bloodshed available to us. The internet and real-time media reporting were integrated into daily life in Iraq. It is time to put policy ahead of politics and success ahead of the status quo. It is time for a new strategy to produce what we need: a stable Iraq government that takes over for its own people so our troops can finish their job. In America, we met this guy who'd been in the army. He'd been over in the Iraq war. He said that our CD helped him get through a hard time in the Iraq war. It's amazing to know that we helped him in some way. It's definitely cool. I don't know what our capabilities are. If I were there, I think it would be nutty to do that. The only country on Earth more containable than Iran is Iraq. And we've certainly made a mistake there. We could have continued Saddam. Whatever the history of U.S. intervention in Iraq, our priorities now should be to protect our people and defend our national security interests, not to try to resolve an intractable religious divide some 1,500 years in the making. Military activities (are) not a role for the United States. There needs to be a number of steps that Maliki and his government must take to demonstrate that he is committed to an inclusive Iraq, something he has not done up to date. , I'm going to reserve judgment on [Rex] Tillerson. But I'll ask him the same question I've asked the others: do you understand the historic lesson that the Iraq war was a failure, a strategic mistake, that's what Donald Trump says. President Bush has delivered a new resolution to the U.N. saying that Saddam has failed to cooperate with U.N. resolutions, freeing us to get our war on. Don't mess with us France, or we'll send Jerry Lewis to Iraq as a human shield. Destroying Iraq was the greatest strategic blunder this country has made in its history. Unless we change course, there's every reason to believe the Iraq War will end up changing the United States more than it will ever change Iraq. How can one talk in a classical language about a child who's torn apart in an explosion in the market near his school? People in Iraq don't talk about their joys, their problems, and the destruction of the country in literary diction. The United States Central Command of the Armed Forces has asked Geraldo Rivera to leave Iraq. It should also be noted that the only three other people that the U.S. military has asked to leave Iraq are Saddam Hussein and his two sons. CIA Director George Tenet briefed a Senate panel ... about the current situation in Iraq. He described how cash was being stolen and women were being assaulted with impunity. Senators love to attend these continuing education seminars. Thanks to General Petraeus, our leadership and the sacrifice of brave young Americans. To deny that their sacrifice didn't make possible the success of the surge in Iraq, I think does a great disservice...the progress has been immense. I personally think that today, Iraq without Saddam Hussein is a truly better Iraq than with Saddam Hussein, but naturally I also feel uncomfortable due to the fact that we were misled with the information on weapons of mass destruction. It's very hard to understand just what our strategy is in Syria, frankly, and on Iraq that this is Iraq's war, that the role of the United States is to help Iraq, to arm, train, support, provide air support, but this has to be Iraq's war. Speaker John Boehner complained that Barack Obama ordered the U.S. military into combat in Libya without clearly defining the mission to the American people and Congress. See, apparently, you're only allowed to do that when invading Iraq. You saw on your TV what happened in New Orleans after Hurricane Katrina. The Reserves or National Guard are usually the people we use for those national emergencies. They weren't here, they were over in Iraq, and so we were less protected. Our country, the United States of America, may be the worlds largest economy and the worlds only superpower, but we stretch ourselves dangerously thin by taking on commitments like Iraq with only a motley band of allies to share the burden. The truth is France has been the chief Western advocate of normalizing relations with Iraq - one of its largest trading partners - for years, partly because France holds billions in IOUs from Iraq that wouldn't be redeemable by a new regime. I think Barack Obama has the overall right strategy and he's been right to resist bringing in massive numbers of American troops. The Iraqis would love to have Americans die for Iraq and the Syrians would love to have Americans die for Syria. The regime must allow immediate and unrestricted access to every site, every document, and every person identified by inspectors. 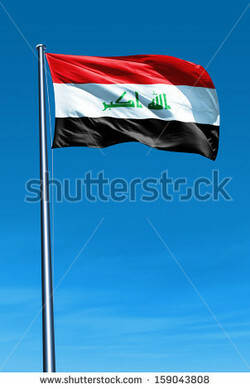 Iraq can be certain that the old game of cheat-and-retreat tolerated at other times will no longer be tolerated. Throughout the lead-up to the war, CNN worked hard to air all sides of the story. We had a regular segment called Voices of Dissent in which we spent time covering antiwar protests and interviewing those who were opposed to the war with Iraq. I was against the war in Iraq because I said it's going to totally destabilize the Middle East, which it has. It has absolutely been a disastrous war, and by the way, perhaps almost as bad was the way Barack Obama got out. That was a disaster. I think we've, again, got to be extremely careful; otherwise we'll misunderstand what's going on in Iraq and in Syria today. Of course, you can't say that those of us who removed Saddam in 2003 bear no responsibility for the situation in 2015. I don't think any sensible person would disagree that the invasion of Iraq led to the massive level of instability that we're seeing right now. I think that was one of the worst foreign policy blunders in the modern history of the United States. What's fascinating is where they come from in the world. People in Bangladesh, a chap in a fire-base in Tikrit in Iraq. Chap in an Irish pub in Dublin. And lovely to think this literary network - or rather network of readers - is well spread out. I was talking about [Donald] Trump and certain things he was saying, that he wanted to go into Iraq and just "take the oil." I said he sounded like the Corleone Family from The Godfather, you know, "Let's just get it all while we got the muscle." Al-Qaeda has one ideology and they go back to the same leadership in Afghanistan or in Syria or in Iraq. That's the question. You have tens of thousands of foreigners, that's definitely correct. We are fighting them on the ground and we know this. I will not support putting American soldiers into Iraq as an occupying force. I don't think that is in our interest, and I don't think that would be smart to do. In fact, I think that would be a big red flag waving for ISIS to reconstitute itself. One of the principles that we operate on in this country is that leaders are held accountable. The simple truth is that we went into Iraq on the basis of some intuition, some fear, and some exaggerated rhetoric and some very, very scanty evidence. More American young people can tell you where an island that the 'Survivor' TV series came from is located than can identify Afghanistan or Iraq. Ironically a TV show seems more real or at least more meaningful interesting or relevant than reality. That does not mean we won't experience the tragedy of the loss of some American lives. We will have an opportunity to instill a democracy in Iraq which will be an example and perhaps force other nations in that region to move in the same direction. No political politicians on the board and stop sub-contracting anyway, which means getting out of Iraq. If anything needs to be policed, it needs to be done through a proper international body... not through us sub-contracting teams of mercenaries. We are engaging in the diplomatic efforts that are required within Iraq among the Shia, the Sunni and the Kurd, among friends, like Egypt, and Turkey and Saudi Arabia, but also enemies like Iran and Syria. They have to have buy-in into that process. This current government in Iraq has never fulfilled the commitments it made to form a unity government with the Kurds, the Sunnis and the Shia. We have worked hard with them within the confines of our ability to do that but we can't dictate to them. This constitution is full of mines that are going to explode. The articles stipulated in this constitution will have grave consequences if they are submitted to a referendum. This constitution will lead to a weak Iraq that is unable to defend itself. If Bush had gone into Iraq for cynical reasons, we could cut our losses now. What's frightening is that he did it for ideological reasons, and therefore he's not going to get out. So it isn't ultimately about oil or about Israel, it's about a belief. The Iraq War is the largest strategic blunder in U.S. history â¦ On every level - moral, strategic, military and economic - Iraq was a failure. And it was you, Mr. Bush and Mr. Cheney, who started this war. It is you who should pay the consequences. Who created the sectarian attitude in Iraq? The occupation, ... We never heard of this before in our history. But it's good that Condoleezza Rice realizes sectarianism is not good for Iraq. All we want from them is fair and clean elections next month. Why would twenty-six-year-old "teenagers" care about political ramifications if their backs are not up against the wall? But if their backs are against the wall they may be plucked to fight in Iraq, and all of sudden they become politicized real quick. We havent been out in many of these countries helping them build infrastructure. How would they look at us today if we had been there helping them with some of that, rather than just being the people who are going to bomb in Iraq and go to Afghanistan? As you may have heard, the U.S. is putting together a constitution for Iraq. Why don't we just give them ours? Think about it - it was written by very smart people, it's served us well for over two hundred years, and besides, we're not using it anymore. The major problem for America is we're losing two wars. We're losing in Afghanistan, we're losing in Iraq. And there seems very little likelihood that we're going to increase the number of troops we have in either place to the point that we can prevail. It's over 800 billion dollars that we have expended [in Iraq]. I believe that Iraq should pay us back for the money that we spent, and I believe that Iraq should pay the families that lost a loved one several million dollars per life, I think at minimum. Every other country where there's absolute chaos now, what is it? They're pluralistic without consensus. Look at almost every single country, from Syria, to Iraq, to Iran, Ukraine, no matter where it is. I just think it is totally counter to our tradition. By threatening war against Iran, Iraq and North Korea in his now-famous "Axis of Evil" address, the president painted himself into a corner. Either Bush now goes to war against one of these regimes, or he will be humiliated and exposed as a bellicose bluff. If it were not for the strong support of the Jewish community for this war with Iraq, we would not be doing this. The leaders of the Jewish community are influential enough that they could change the direction of where this is going, and I think they should. The people who died in the Twin Towers in that terrible crime mattered. The people who were bombed to death in dusty villages in Afghanistan didn't matter, even though it now seems that their numbers were greater. The people who will die in Iraq don't matter. This is the company we keep when it comes to the death penalty: China, the number one executing country; Iran, Iraq, Saudi Arabia, those are the top 4, and number 5 is the US. And those are not countries that are known as champions for human rights, you know. I remind you again we had those elections [in Afghanistan and Iraq] because we had boots on the ground and we had people that could help people, and we had people on the ground that could get into somebody's face when they had to, and do whatever was required.